Illinois Governor asks senate to "walk a mile in my shoes." Rod Blagojevich told the Illinois Senate that if he's guilty of anything, it's pushing too hard to do the right thing. Illinois Gov. Rod Blagojevich didn't disappoint when he stepped onto the Senate floor to give the closing arguments in his own impeachment trial Thursday -- perhaps his last act as governor. Blagojevich told the packed Senate gallery that he would not resign because he has done nothing wrong. He said he chose to speak on the Senate floor because of response he got from the public during his media blitz, with people asking him why he didn't argue his case directly with the Senate. The governor went on to say that no evidence was presented in any of the impeachment charges except for Article 3, and that evidence was only the four secretly recorded audio tapes. "There was no criminal activity on those four tapes. You can express things in a free country," Blagojevich said. "Those are conversations relating to the things all of us in politics do relating to campaigns and to win elections." He said that removing him from office without evidence would create a "dangerous precedent" for all Illinois governors in the future. Blagojevich then began going through the other impeachment charges one by one, defending what he did and why he did it. Blagojevich then tried appealing to senators' sympathy, asking them to "walk a mile in my shoes." "Imagine ... your whole world changes, not even knowing what it's all about ... and before you can even catch a breath, everyone's convicted you," he said. "It's painful and it's lonely." As he began to sum up, the governor said that if he's guilty of anything, it's pushing too hard to do the right thing. "Charge it to my heart. Charge it to a desire to help families I came from and life stories I heard along the way," Blagojevich said. When Blagojevich finished, Supreme Court Justice Thomas Fitzgerald told him he was welcome to remain, but the governor declined and waved to senators as he exited the floor. The trial then took a one-hour recess. When it resumed, House Prosecutor David Ellis began his rebuttal. "The governor can give a pretty good speech. But I want to talk about the Rod Blagojevich when he's off camera, when he doesn't know anyone's listening," Ellis said. "When the camera's on, the governor is for the little guy, the little people. But when the camera's off, what are his priorities? "He was even here today, but he wouldn't put himself under oath. He talked more about the evidence with Barbara Walters on The View than he did in this chamber today," the prosecutor said. "He does not have a constitutional right to be governor -- that's what he doesn't understand. Being a governor is not a right, it is a privilege, and he has forfeited his right to be governor, he has traded it for personal gain time and time again. "I think the people of this state have had enough. They are looking to you now. And they want to know, is today going to be more of the same? Or is today going to be a new era in this state ... Are we finally going to turn the page?" Without another word, Ellis then stepped away from the podium. After Ellis' rebuttal, the vote began on whether or not to impeach the governor. The vote rules give all 59 senators the chance to speak for up to 5 minutes if they choose. They will speak in alphabetical order with Senate leaders John Cullerton and Christine Radogno speaking last. Assuming the Senate votes to remove Blagojevich from office, a second vote will then take place on whether he should be barred from holding public office in the state ever again. Ellis gave his own closing arguments earlier Thursday morning. He reiterated the allegations that Blagojevich conspired to sell now-President Barack Obama's Senate seat. "The evidence shows that the governor repeatedly directed subordinates to act," Ellis said. "What did he say to them when he sent them on their way? 'You should assume the whole world is listening. Don't put it in writing.'" "Who says those words except somebody who has something to hide, something to cover up?" Ellis asked the Senate. The prosecutor went on to detail charges that the governor tried to coerce the Tribune into firing members of its editorial board in exchange for state aid to sell Wrigley Field. Ellis kept repeating the phrase, "the governor's own words, the governor's own words," characterizing secretly recorded conversations between the governor and a fundraiser as "scheming and plotting." 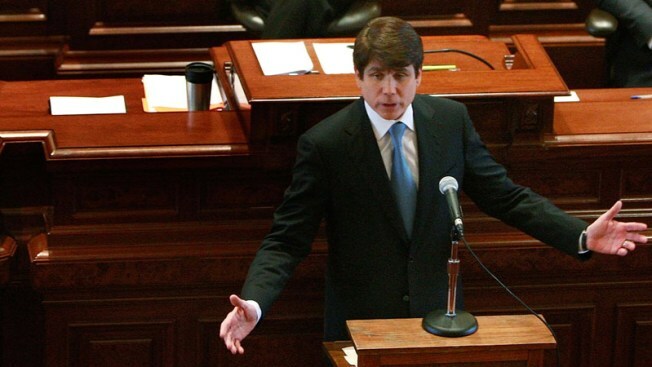 If Blagojevich is convicted, he will be removed from office and immediately replaced by Lt. Gov. Patrick Quinn, a fellow Democrat. Quinn is in Springfield Thursday awaiting the possibility. Quinn said Wednesday that he'll be waiting in the lieutenant governor's office Thursday morning. After the Senate votes to impeach (which Quinn is certain will happen), they'll come and get him and usher him to the House chamber where he will take the oath of office. "He does not intend to let much time go by before the state has a new governor, and he believes it will be him by constitutional fiat," he added. Blagojevich's request to speak shocked the Senate when it was announced Wednesday. Until now, Blagojevich had boycotted the proceedings, calling them biased and unconstitutional. Blagojevich did not testify, which would have involved taking an oath and answering questions from the prosecutor and senators. Sen. Dan Cronin, R-Elmhurst, called the decision "cowardly, but consistent with the way he has governed." Cullerton, the Senate president, made the announcement earlier in the day. "It's my understanding that the governor wishes to file an appearance to give a closing argument, not to testify or to submit himself to cross-examination," Cullerton told the trial. "Just to give a closing argument." Cullerton recommended that the Senate allow Blagojevich to speak. That view was supported by Radogno, the Senate's top Republican. Will Statement Make a Difference? Will Blagojevich's remarks, however well executed, make any difference in the Senate's final decision? Most say no, noting that the jury pool has been so alienated by the governor over the last six years that there's virtually nothing he could say to them that would change their minds at this point. The prosecution rested its case Wednesday, just the third day of the unprecedented trial on whether Blagojevich has abused his power. "I don't think he's going down there to resign, I think he's going down to make his appeal to the senators," the spokesman said. While the Senate has considered accusations Blagojevich is corrupt, the governor appeared on one New York news show after another to proclaim his innocence and declare the trial rigged against him. The two-term governor has denied any wrongdoing since being arrested last month on a variety of corruption charges, including scheming to benefit from appointing President Barack Obama's U.S. Senate replacement and demanding campaign contributions in exchange for state services. Associated Press writers Deanna Bellandi in Chicago and Andrea Zelinski in Springfield contributed to this report.